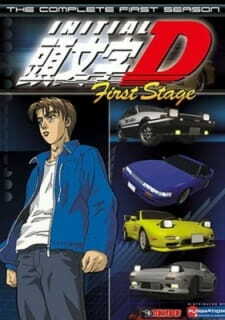 The Initial D series has been the one and only, most popular and the best street racing anime in the world. Nothing beats this all-out adrenaline pumping, heart racing series in any way. Street racing fans will be very pleased. This anime review takes the entire Initial D series into account. I have always loved racing cars and when I first watched this anime, I was completely hooked. Street racing, burning rubber and heart pumping action is to be expected throughout the whole series. The anime doesn't solely just focus on street racing as there is also romantic comedy elements to it. Mainly though, this is a serious racing car anime. hands down the only racing car anime to be produced. I just loved how the story initially evolved, an unknown street racer taking on every racer from the Gunma prefecture. I would say that after four stages(series) of this anime, I am extremely satisfied with the overall story. There isn't any more I can ask for. For a late 90s to early 00s anime, the art is obviously expected to be lower quality than today's standards. Although I watched it in SD, the quality was not that bad. The First Stage was decent but the graphics really did improve from the Second Stage onwards. There were some 3D model rendering moments throughout the series which made the cars look so much more menacing. Each car were drawn to specification and had the correct features and style, which made them stand out from one another. Sound was of good quality. Cars made the nostalgic "vrrr" effects and the voice acting really suited the characters. The pumping background music really contributed to the sense of action-packed street racing. You will be listening to many different engine sounds throughout the anime so no repeated use of the same sound is used here. Sound effects were really well edited and true to its nature throughout the anime series. The characters were well loved by the fans of the anime. From the bored looking Takumi to his energetic friend Itsuki, the anime does not lack any style from a wide range of different personalities. However, when the going gets tough, the tough gets going. You will be used to many verbal shouting and personal monologues from many of the characters whilst they are driving full-on on the streets of the mountain passes. Overall, I must say that Initial D is one of my favourite animes to date. It may seem old, but it was one of the biggest hits back in the day. The art work may be old, but everything else makes up for how well the anime was put together. You can sense the feeling of burning rubber and fast-paced adrenaline throughout the whole series. You will also never tire out from the music or from the characters. This is one well made anime and I highly recommend racing fans to watch it. STORY: 7 Story is pretty simple and straightforward. There are no plot holes or unexplained events in the anime. It could seem a bit predicable but well worth to watch. For a late 90s anime, the art was really well done. It got even better in the late stages as technology improved and more powerful computers were used. Scenes were well drawn out and the use of 3D models in some scenes really brought out the cars' beauty. You gotta love heart-pumping music in a street racing genre. Also, the sounds of burning rubber and screeching tires throughout the whole anime is really satisfying. Voice acting is not bad. Memorable characters with different personalities. You will instantly love or hate any of the characters just by the way they look. I loved the series. It is the only anime that features street racing as the main theme. You will love the wide range of old school racing cars such as the Nissan GT-R as well as the Honda Civic. It's a satisfying anime from start to finish. No boring bits, just pure acceleration to the very end. Also, the races will get your heart pumping as you watch the racers race for their lives on the steep mountain passes. I will definitely recommend this anime to be watched by all racing genre fans.